The last five years have seen dramatic and fundamental changes in whistleblower procedures for organisations. Prompted by a spate of important public disclosures, organizations are now mandated by law to implement effective arrangements enabling employees to speak up about perceived wrongdoing. Currently few resources exist to help with this. 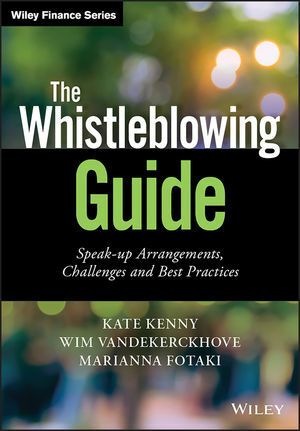 To help fill the gap, The Whistleblowing Guide examines the opportunities and challenges associated with different types of whistleblowing and speak-up arrangements, making recommendations based on best practices you can trust. The Whistleblowing Guide offers conceptual clarification about these key issues, including a focus on internal and external speak-up procedures, organisational response and communication, impartiality and trust. KATE KENNY is Professor in Business and Society at NUI Galway. She has a Phd from Cambridge University's Judge Business School and has held fellowships at the Edmond J. Safra Lab at Harvard University and Judge Business School. She researched whistleblowing for ten years with projects funded by ESRC, British Academy, and Leverhulme Trust. Her book, Whistleblowing: Toward a New Theory, is published by Harvard University Press in 2019. WIM VANDEKERCKHOVE is Reader in Business Ethics, University of Greenwich Business Faculty, and co-director of the Centre for Research in Employment and Work (CREW). He has published extensively on whistleblowing, socially responsible investment and global ethics and serves as an expert for Transparency International Belgium and the Council of Europe. MARIANNA FOTAKI is Professor of Business Ethics, Warwick Business School and a Senior Editor for Organization Studies. She has a PhD from London School of Economics and was a Network Fellow at EJ Safra Centre for Ethics, Harvard University (2014-15). She has worked as a medical doctor for Médecins Sans Frontières and Médecins Du Monde, as advisor to the governments of Armenia, Georgia and Russia, and has co-directed the Centre for Health and the Public Interest (2014-2017).